As the summer season descends upon the art world, museum destinations often increase in popularity as the close of Art Basel and other fairs incite a slight gallery slump. 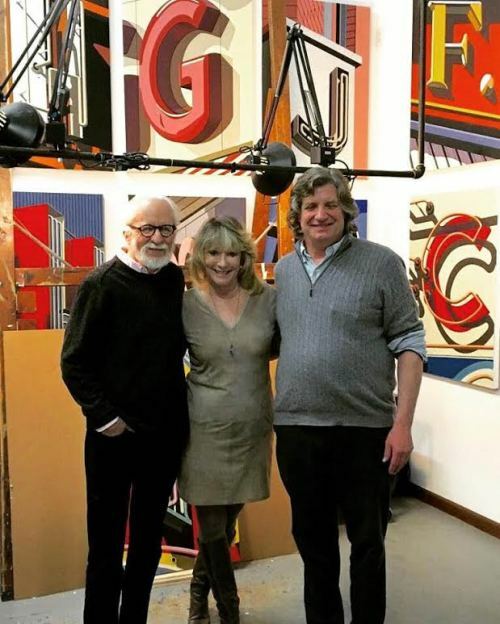 Nevertheless, FADA galleries remain active exhibiting summer shows and contributing both their knowledge and artworks to ongoing museum exhibitions. 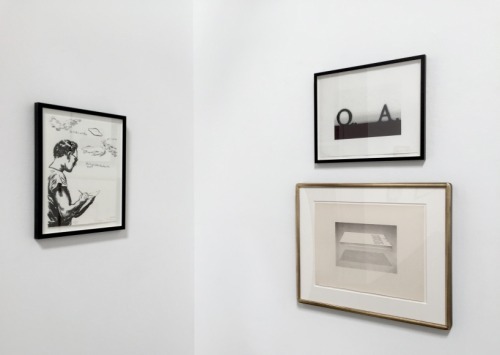 While many associate the act of looking at art with the museum setting, gallery shows offer an intimate space to view other works by museum-favored artists. 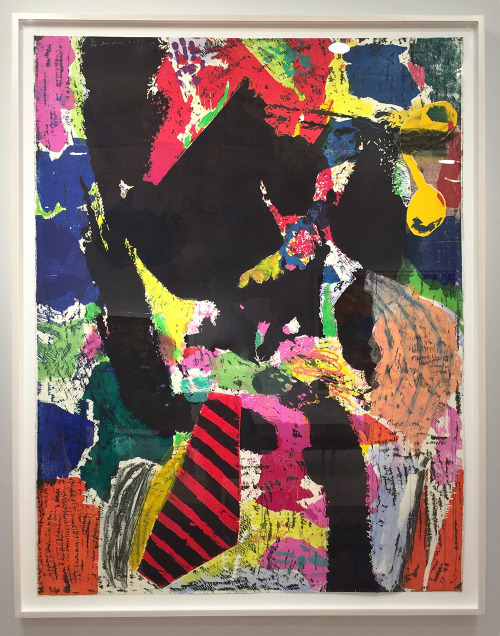 As the summer season descends upon the art world, museum destinations often increase in popularity as the close of Art Basel and other fairs incite a slight gallery slump. Nevertheless, FADA galleries remain active exhibiting summer shows and contributing both their knowledge and artworks to ongoing museum exhibitions. While many associate the act of looking at art with the museum setting, gallery shows offer an intimate space to view other works by museum-favored artists. Coincidently, many blockbuster museum exhibits this summer feature FADA represented artists, with showcases of their artwork additionally displayed at FADA galleries. Methods of curation, perhaps approached differently in each art world venue, nevertheless offer an audience various ways to understand artists and their bodies of work in conversation with the themes closely studied by museum and gallery professionals. A visit to a gallery space broadens ones knowledge of both the art world and decisions behind curation. Enhance your summer vacation with stops to both museums and galleries; especially considering the personal relationships forged by galleries and artists. Galleries are often the first to exhibit artists as they navigate their way to cultural status by way of museum patronage. 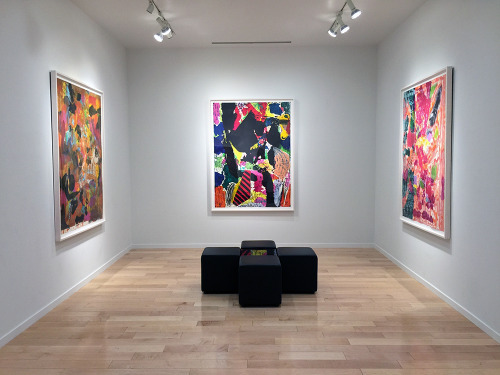 Jonathan Novak Contemporary’s current show focuses on Dine’s dalliance with Post-War art: Abstract Expressionism. While today he is known for his iconic use of heart, robes and Venus de Milo motifs, Jonathan Novak Contemporary’s curatorial eye illuminates upon Dine’s large abstraction, “a new realm of color, surface texture, composition and form.” Major contemporary art museums, like the recently renovated SFMOMA (pictured), are also host to Dine’s work. 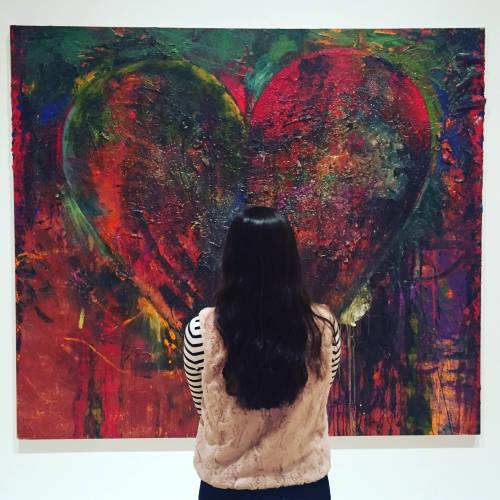 (ABOVE) Jim Dine, Cheval Blanc Poem – 67 1/8″ x 49″, 2015, Jonathan Novak Contemporary Art. A retrospective of Californian artist Ed Ruscha, Ed Ruscha and the Great American West, opened at the de Young Museum in San Francisco. 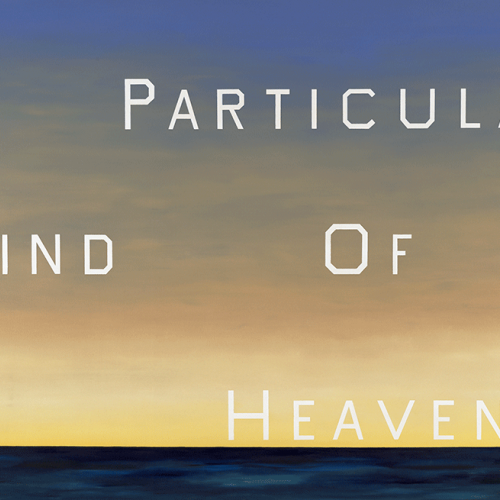 The show meditates upon Ruscha’s visual connection to the West, explored in the works representative of its mythological landscape. Some are enhanced by laconic, yet mystical, phrases, a trait similarly explored in Leslie Sacks Gallery’s current show, Group Text. Featuring works by Ruscha and notable contemporaries Andy Warhol (whose pop art is deeply rooted on the East Coast.) It nevertheless explores the powers of words and texts within contemporary consumer culture, manifested in Warhol advertisements or Ruscha’s sparse landscapes. Ed Ruscha (b. 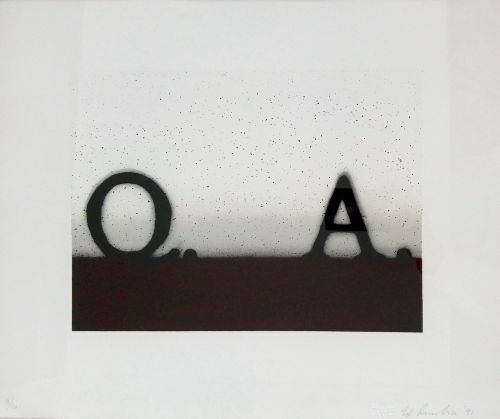 1937), Question & Answer, 1991, Lithograph, 15 1/8 x 18 inches, Edition of 50, Leslie Sacks Gallery. 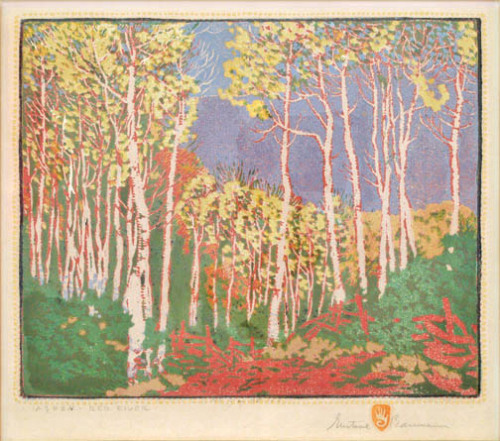 Gustave Baumann, Piñon-Grand Cañon, Color Woodblock on paper, Gift of Mr. and Mrs. William Hume, Legion of Honor, San Francisco. San Francisco’s Legion of Honor complements the Rushca show with their own, Wild West: Plains to the Pacific. 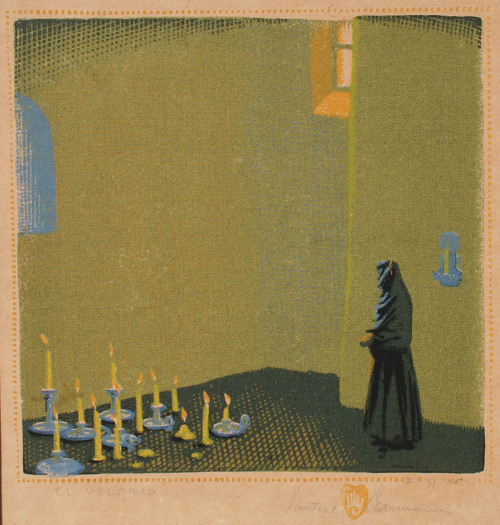 The exhibit features a color woodcut on paper by Gustave Baumann, heavily represented in the inventories of William A. Karges Fine Art, David Cook Fine Art and Eckert & Ross Fine Art. 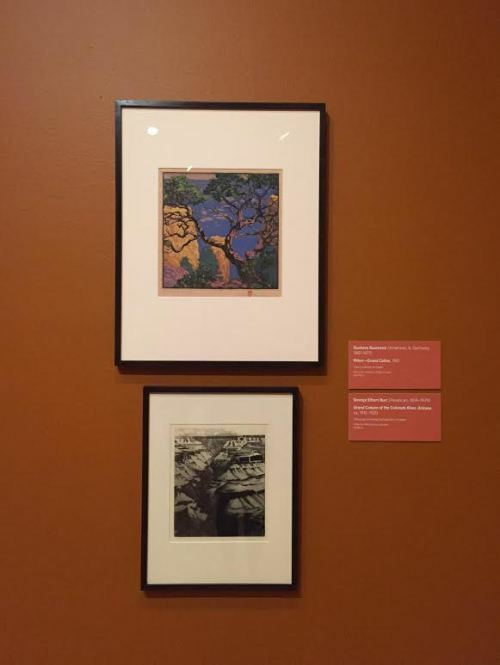 Baumann’s colorful depictions of the West’s magnificent, natural scenery, executed through woodblock prints, have had a home in San Francisco since he exhibited at the 1915 Pan-Pacific International Exhibition. Gustave Baumann, Aspen Red River, Woodcut, David Cook Fine Art. Click to inquire. 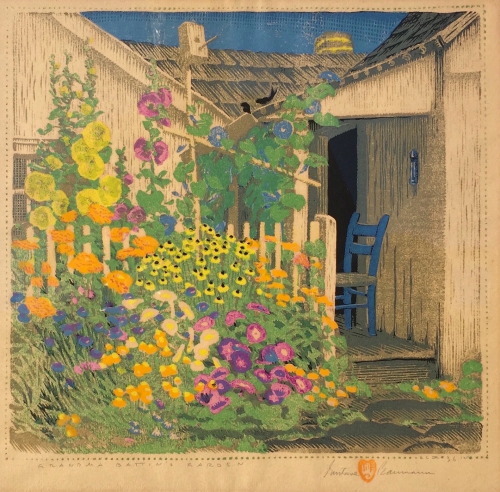 Gustave Baumann, Grandma Battin’s Garden, Color Woodblock Print, Eckert & Ross Fine Art. Click to inquire. Gustave Baumann, El Velorio, Woodblock, William A. Karges Fine Art. Click to inquire. The Norman Rockwell Museum in Stockbridge, Massachusetts is host to Rockwell and Realism in an Abstract World. Jane Eckert of Eckert Fine Art, and representative of photorealist Robert Cottingham and realist artist Eric Forstmann, offered their insights about art and the creative processes in a conversation sponsored by the museum and which focused on perspectives on realism and the role of memory, meaning, and personal inspiration in art. 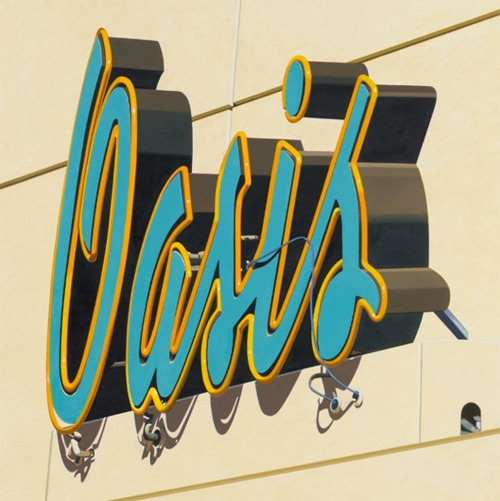 Featured in the exhibit is: Oasis, 2013. Robert Cottingham. Jane Eckert Fine Art. All rights reserved. 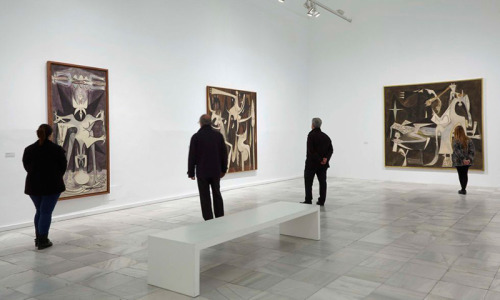 “A pioneer of cross-cultural painting that infused Western modernism and African and Caribbean symbolism,” Wifredo Lam is examined at the Museo Nacional Centro de Arte Reina Sofía, Madrid, in an exhibit co-sponsored with the Centre Pompidou and Tate Gallery. 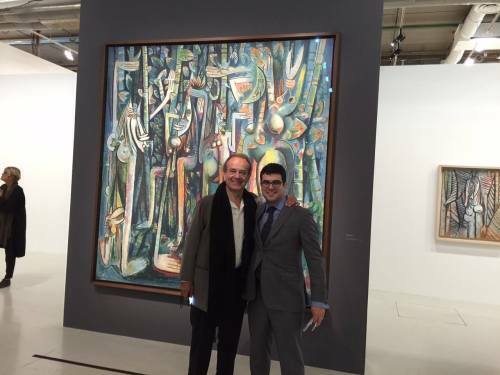 Notable Cuban art gallery Cernuda Arte contributed their knowledge of the artist to the show and were able to attend the opening of the exhibit in France. They additionally hold works by Lam in their inventory. 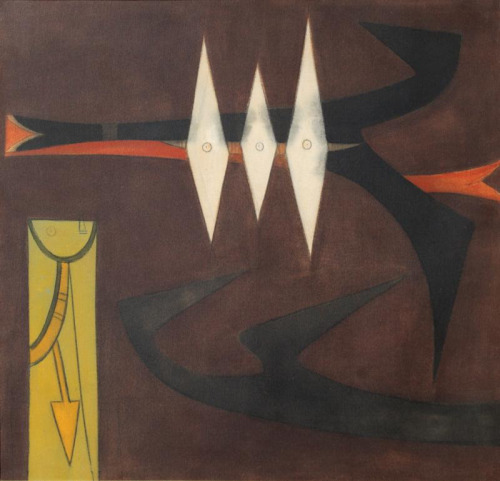 Wifredo Lam, Birds, ca 1950, Oil on canvas, Cernuda Arte.